Plow & Hearth is a retailer of home and garden products, based out of Madison, Virginia, United States. 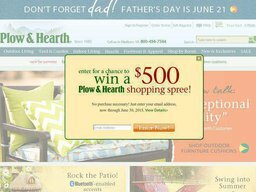 They operate as a subsidiary of 1800 Flowers, and sell their inventory through a traditional mail order catalog, several retail stores, and through their online store at PlowHearth.com. They are perhaps best known for their hearth and fireplace accessories, but sell a wide range of everyday home items. You can get discounts on these online by redeeming one of our Plow & Hearth coupons. Plow & Hearth was founded in 1980 by Peter and Peggy Rice and Michael Burns, and saw immediate success, being named one of Inc. Magazine's fastest-growing private companies only a few years in to the operation. In 1998 the company was acquired by 1800 Flowers, who subsequently launched the online store, which is now one of their key drivers of sales. Today Plow & Hearth runs out of a 38 acre facility, has hundreds of thousands of catalog subscribers, and stores in Virginia, Maryland, North Carolina, New Jersey, Pennsylvania, and Delaware. Ting Xu currently serves as President. Plow & Hearth stock a wide range of home and garden products, as well as outdoors shoes and clothing. The website is very user-friendly, allowing you to browse via appropriate categories and use the search bar if you know exactly what you want. There are also separate pages for new items and sale items, so you are sure to find a bargain. If you want to make further savings you can paste our Plow & Hearth coupon codes in to the box at checkout to redeem the offer. We also list Plow and Hearth in store coupons that you can print off and use in store. Home: Bedding, Pillows & Towels; Rugs & Mats; Curtains & Window Dressing; Furniture; Home Decor & Wall Art. Hearth: Fireplaces, Stoves and Heaters, Fireplace Accessories; Wood Carts & Tools; and Outdoor Fire Pits. Outdoors: Outdoor Furniture; Lighting & Patio Decor; Gardening Tools & Planting; Feeders & Birdbaths; Landscaping; and more. Clothing & Accessories: Tees & Shirts, Tops & Sweaters, Jackets & Outerwear, Nightwear, Hats & Gloves, Socks & Underwear, Jewelry and more. Footwear: Boots, Casual Shoes, Sandals, Slippers, and Clogs. To help you find what you want product listings are easily sorted and refined by price range, color, size, style, popularity and other parameters depending on the category. There are also user ratings and reviews to help you make a decision. Plow & Hearth allow you to checkout using your Paypal account (including Paypal credit so you can buy now and pay later), and Bill Me Later. You can also pay directly on the site using most major credit and debit cards, such as Visa, Mastercard, American Express, and Discover. Plow & Hearth aims to dispatch all orders within 24 hours. The charges vary depending on the price of the merchandise, so you should add items to your basket, enter the delivery address and then choose your option to get an accurate cost calculation. As standard, delivery will be made within five to seven working days. The company also offers international shipping, although they must be contacted to arrange this. Furthermore, customers can choose Express Shipping for an extra $8.99. Large and heavy items may be sent through motor freight shipping. Along with our regular Plow & Hearth coupons there is also sometimes free shipping offers. Just look out for a Plow and Hearth free shipping promo code. Customers can return their purchases within 90 days if they are not fully satisfied.. Fast exchange can be arranged over the telephone. Other returns will need to be completed by mail, and large items will need special arrangements. All orders come shipped with a return form that you should fill out and include with the return package, and there is also a prepaid UPS shipping label worth $6.95, which will be deducted from your refund or exchange, unless you are making a claim on a damaged or defective item.